¤ The unique make-up of each organism is determined by the double-stranded DNA in the nucleus of our cells. Telomeres are found at the tips of DNA strands and prevent the loss of genetic information resulting from the chromosome-shortening which occurs with each cell division. Every time a cell divides, its replication is unfortunately incomplete and telomeres inevitably get shorter. The greater the frequency of cell division or the greater the presence of oxidative stress, the more the telomeres shorten until, at a critical size, the cell becomes senescent. Numerous studies show that progressive telomere shortening is closely linked to many age-related diseases (cardiovascular disease, infectious diseases, etc) and is also predictive of early mortality in elderly subjects. ¤ Telomeres can therefore be thought of as a biological clock, eventually signalling the onset of ageing in the body, and ultimately death. There is, however, an enzyme called telomerase which reverses the process of telomere degradation, enabling the production and growth of telomeres as well as DNA repair. The problem is that, over time, telomerase production declines. ¤ Russian researchers have discovered a tetrapeptide that is indeed able to reactivate telomerase production in cells, and thus repair telomeres and rejuvenate the whole body as a whole by directly addressing the source of ageing. ¤ Two scientists are behind this major advance. In a paper co-authored with Dr Ward Dean in 1992 entitled “The neuroendocrine theory of aging and degenerative disease”, Professor Vladimir Dilman noted that the biopeptide epithalamine could increase the lifespan of rats by 25%. These early findings were then confirmed in a number of subsequent studies conducted by Professor Vladimir Khavinson, a gerontologist and President of the St Petersburg Institute of Bio-regulation and Gerontology of the Russian Academy of Sciences in Moscow. ¤ According to these researchers, the extension in lifespan could be the result of the action of biopeptides formed by the connection of several amino acids by peptide bonds. ¤ These peptides are natural bio-regulators that act to both potentiate cell division, as well as stimulate brain activity, and even participate in the mechanisms of tumour reduction. ¤ Professor Khavinson’s research on elderly or senile individuals showed that biopeptides improved physiological function as a whole, and reduced mortality by almost 50%, over 15 years of clinical observation. ¤ In fact, he demonstrated that biopeptide-DNA interactions epigenetically controlled cell genetic functions and may be responsible for restoring homeostasis and successfully extending life expectancy, affecting even the earliest stages of life origin and development. ¤ The most widely-studied biopeptide is epithalamine, a substance secreted by the pineal gland which also produces melatonin. ¤ Epitalon is this same biopeptide, synthesised from four gero-protective amino acids (tetrapeptide : L-alanyl-l-glutamyl-l-asparagyl-glycine), which can be administered orally, parenterally, sublingually, intra-nasally and even topically. The many studies and clinical trials conducted on animals and humans over more than 35 years demonstrate that epitalon, a substance biologically identical to that produced by the body, can reset the biological clock of cells to zero, so that the cells regain their integrity and ability to replicate, enabling both repair of the body’s tissues and immune system and re-establishment of optimal organ function. ¤ From the age of three months until their natural death, mice were given the tetrapeptide epitalon (Ala-Glu-Asp-Gly) for five consecutive days each month. ¤ 108 mice were divided into two groups, one receiving epitalon and the other a placebo. Treatment with epitalon was shown to lower the frequency of chromosome abnormalities in bone marrow cells and in particular, to increase the life span of the last survivors by 13.3% and maximum life span by 12.3%. Compared with the control group, treatment with epitalon prevented the development of leukaemia. The results of this study suggest epitalon has an anti-ageing effect and is safe for long-term use. 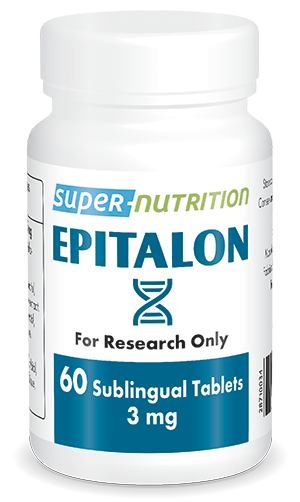 ¤ So, if as a human you are programmed to live to the age of eighty, epitalon could help you reach - and even exceed - ninety, in perfect health. ¤ A seven-year experiment conducted on a group of seniors, in this case, elderly members of the eminent Russian Academy of Sciences, showed that a daily injection of epitalon for ten days every six months increased longevity for a significant number of them. In comparison with a control group who did not receive epitalon, mortality was reduced by 30% to 50%. The age-associated decline in expression of interferon gamma by lymphocytes is one of the principal mechanisms that causes a state of immunodeficiency in elderly people. According to one study, epitalon is able to activate lymphocyte proliferation in the thymus during ageing. The immune protection provided by this peptide may therefore be explained by its activation of interferon gamma production in T cells. Experiments on mice have clearly shown an inhibitory effect for epitalon on the development of spontaneous mammary tumours, suggesting that a down-regulation of the expression of certain genes in mammary adenocarcinoma may be responsible, at least in part, for the anti-tumour effect of epitalon. • It regulated production of melatonin and cortisol in ageing monkeys and thus helped normalise the circadian rhythm of cortisol secretion. • It preserved the morphological structure of the retina in retinitis pigmentosa, a congenital degeneration of the retina. • It inhibited proliferation of colon tumours and increased apoptosis of cancerous colon cells in rats. • It can be considered an effective protector of the female reproductive system and was shown to correct impairment in the reproductive cycles of rats. Almost unknown in the West until now, epitalon was only available through advanced research or medical centres. It is now available to everyone, as sub-lingual tablets, a particularly stable form which ensures optimal absorption and ease of use. Generally recommended doses range from 1.5mg to 9mg a day, with an average maintenance dose of around 3mg a day, depending on whether a therapeutic or prophylactic effect is desired, for as long as required. Take on an empty stomach for optimum absorption. Other ingredients : sorbitol, xylitol, stearic acid, peppermint flavour, stevia extract.